This hour-long documentary brings to light the fascinating story of how one man, conceived, engineered and financed the building of the first fully underground hydro-electric plant in the nation. Charles Baker brought electricity to the masses and forever changed the lives of those living in the Northwest. Nominated for an Emmv and Broadcast on KCTS. 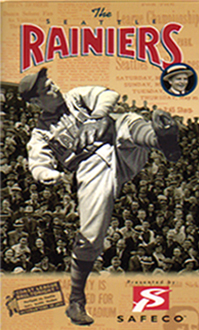 A nostalgic documentary that follows the legendary Pacific Coast League baseball team from 1938 through their final years in the mid-60's. In 1999, it screened at SAFECO Field and broadcast on KCTS. In 2001 and 2009, it was the featured program on FOX SportsNet during the All-Star weekend. This 45-minute documentary captures the story of the high-speed, electric transit system (1902-1928) that sparked the growth and development of South Seattle. Winner of the 1997 National American Public Works Award and broadcast on KCTS, KBTC and continues to air on Seattle's Municipal Channel.